Use these Interview tips and insight on the popular questions to help you through a Job interview. 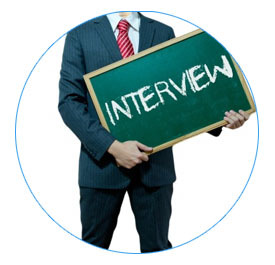 Its also covers some tips on how to face the interviewers tough questions and also key points which we have to avoid during interview. Listen attentively before you answer the questions. Be honest: Why do you want this job? Or Are you impressed by the company’s view on social and corporate responsibility? Are you really interested in what the position entails? Or is it just the increase in salary? Or company benefits? Besides the remuneration package, you should always look at all aspects of a job such as cultural fit, management style, benefits and growth opportunities before making a decision. These factors are equally critical to your career. Handle this question by knowing exactly what will be expected of you. Be prepared and do some research. Have you seen the job description? Have you researched the company’s website? Do you know people who work there who are recommended the company as a good employer? Avoid sounding vague or self serving. Please do not say statements like “I think I am good at it”,” It seems like a good opportunity for me”, “Because the job pays well”,” Because the economy is not doing well”. Adapt your answer to suit the role. Will you have increase responsibility? Will you be supporting one senior director instead of a team of 50? Will you have more varied work scope and be involved in company projects and events? This question is all about selling yourself. Why should the company hire you? Why chose you over other candidates? Are you proficient at Microsoft Office? Are you creative and do you really think you can add value to the company? By looking at the job description, try pointing out your strengths by using examples of work you previously done in relation to the requirements of this role. Some suggestions on how you can answer the question. “ I believe that I meet the requirements listed in your job description. I feel that I would really excel in this role as I (Or role type). In my previous role, I was responsible for ….. ( Use exact examples of how you can prove your value. Show enthusiasm for the role and sound confident when you answer. If you cannot convince yourself that you are perfect for the role, it will be more challenging to convince someone else. This is known as a negative question, one that interviewers use often to test your ability to keep your cool. Please be honest to yourself: We all have weaknesses, and no one is perfect. But it does not mean you should allow your weaknesses to get in the way of your dream job. Instead, you can spin your weaknesses in a positive manner. Look at the job description and choose one required responsibility you feel you can improve on. For example, are you afraid to make public presentation? Does your time management need a little work? How are your sales techniques? Do you feel that you will benefit from Microsoft Office Training? Always tailor your answers for the different roles and positions that you are applying for. There is no right or wrong answer to this question. However, the way you answer this question is more important than then what you say. Please be positive and confident in your answer rather then being defensive and unsure about what you want for your near future. Tell the interviewer that you are uncertain about what you want and are trying out the job to find out your actual interest and passion. Do not give unrealistic goals. Must always bear in mind that the next question the interviewer is going to ask is how are you going to achieve your goals. Avoid being boastful and unrealistic. Always remain positive when discussing your reason for leaving. This is not the time to rant about how unreasonable your current boss is or how bitchy is your collegues. Whatever reason you may have for leaving, make sure you give your answer a positive spin. If you are feeling undervalued in your role or have a personality clash with your boss or colleague , consider how this would sound to a potential employer. Make sure that your answer puts you in a favorable light.